Fig. 1 NASA concept of ancient Mars. 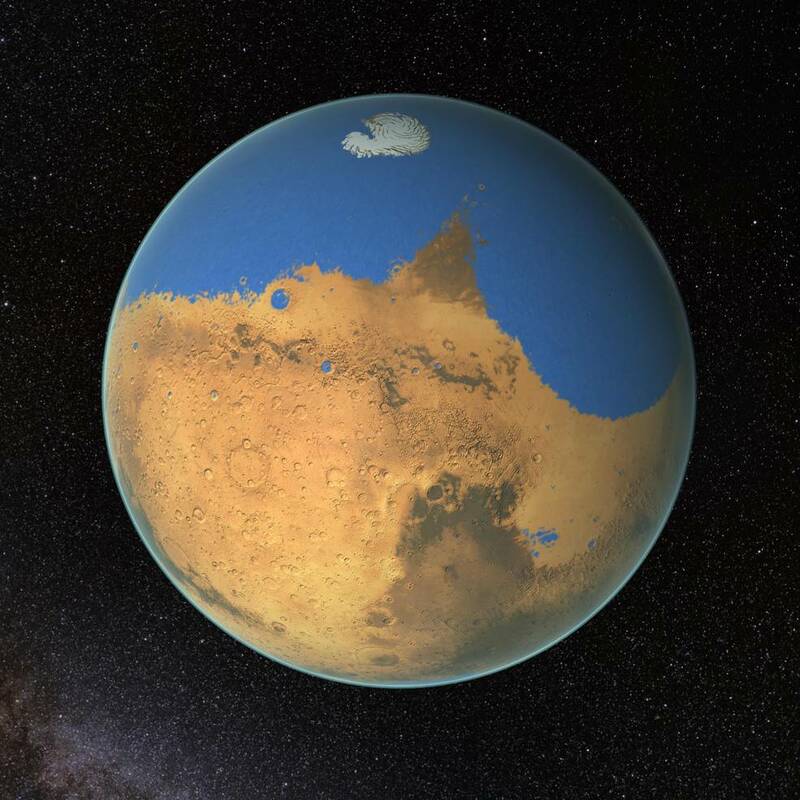 After searching Mars for years, a submerged lake has been found near Mars’ south pole. This is not surprising, because more than five million cubic kilometers of ice have been identified at or near the surface of modern Mars, enough to cover the whole planet to a depth of 35 meters (115 ft). The suspected lake is only 12-km in diameter and thought to be liquid because it is salty and not in contact with the atmosphere. A NASA sanctioned scientist writes “Perhaps about 4.3 billion years ago, Mars would have had enough water to cover its entire surface in a liquid layer about 450 feet (137 meters) deep. More likely, the water would have formed an ocean occupying almost half of Mars’ northern hemisphere, in some regions reaching depths greater than a mile (1.6 kilometers).” The current ‘scientific’ view is that everything happened billions of years ago, but this view is not consistent with the data. Fig. 2. The outlow channel and the crater named Orson Well at the equator had their water drawn toward the north pole. A number of larger submerged lakes on Mars gave up their water to the Earth between 3687 and 687 BC, during the time covered in the Bible from Genesis to Isaiah 65:17 For, behold, I create new heavens and a new earth: and the former shall not be remembered, nor come into mind. This added approximately 150 m to the oceans of the world (17 million km3), evidenced by the submerging of the continental shelves today and many ancient harbor facilities. 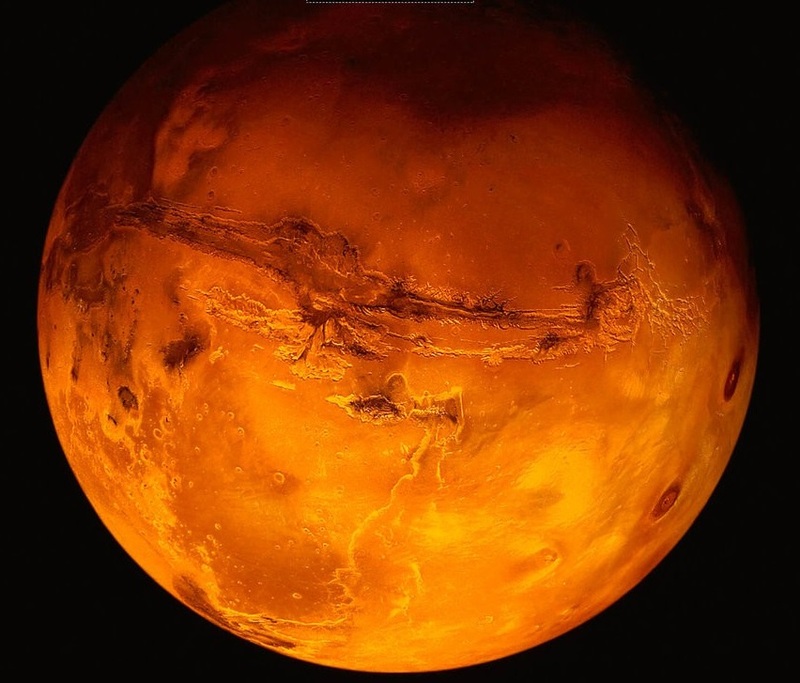 Mars was known as Ba’al in the countries surrounding Israel, but although Jehovah forbid its worship, the name shows up 300 times in the Bible. These features are not 3 billion years old. Anyone with a brain can see that in light of the global dust storms on Mars observed in the last twenty years. During this period Mars was in a geostationary orbit only 35,000-km above Mt. Kailash in Tibet, appearing as a globe with a diameter of 30 degrees – ten fingers held at arms length as told in the RigVeda. As a result, this single mountain, the focus of the Himalayan mass anomaly, was called “Indra’s Home on Earth” and is sacred in four different Eastern religions, Hinduism, Buddhism, Bön and Jainism. THERE IS A REASON FOR THIS. 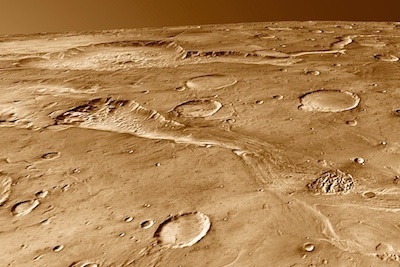 At the end of each visit of Mars to the Earth (there were one hundred) the solid core of Mars was forced out through another feature ,Valles Marinaris, THE CORE IS NOW THE PLANET MERCURY!. This feature was called ‘the eye of Ra or Horus’ by the Egyptians when it first appeared, but when it continued into space and zoomed around the Earth they called it Hathor. iAfter each 14.4-year period orbiting the Earth, it zoomed around the Earth to the East in a slingshot maneuver and caught up to the outer shell drifting to the west – ninety-nine times! They had a hieroglyph for the eye of Ra. Compare the Hieroglyph with the feature and decide whether Mars was close to the Earth or not. One more image – a carving in stone of Mars from the reign of Akhenaten. The Tharsis Bulge is easily seen on it. Note that the globe of Mars was larger in proportion to during this Vedic Period, because the solid iron core was still present. WAKE UP people. Don’t accept these old ideas. There is a much more exciting universe out there. ~ by Angiras on July 29, 2018.